in order to get the most up-to-date information. Items in pink, for 2018! Items in aqua, new for 2019! June 1-2 and 8-9, 2019 - South Lake Tahoe, California - 2 Weekends! June 8-9 and 15-16, 2019 - Canby, Oregon - 2 Weekends! July 14-15 through August 11-12, 2019 - Big Bear City, California - 4 WEEKENDS! August 3-4, 10-11, 17-18, 2019 - 3 Weekends! October 27-28 and November 3-4, 2018 - 2 Weekends! Find Faires in your area! Coin Belts, Tribal Hair Falls, Hip Scarves, Ankle Bells & More! 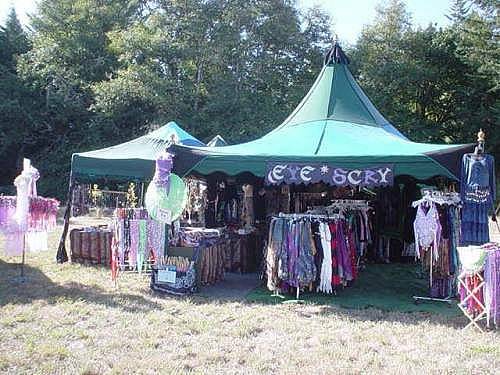 Eye Scry Designs on Facebook! Throughout this website, all images, text files, poetry, essays, or other material is all copyrighted by EYESCRY.COM and the site authors individually and jointly, and may not be used elsewhere on the net, within other websites, or in print, without the written permission of the site author. No material from this site or any of its internal links may be used without written permission.